Six storey, 115,000 sq ft office space. Modern workspace that reflects Dunnhumby’s culture. The design successfully completes the top half of a building that was left unfinished at the onset of the First World War. The development will include a £200,000 investment in the surrounding Brook Green area and provide airy views of Little Brook Green directly opposite. 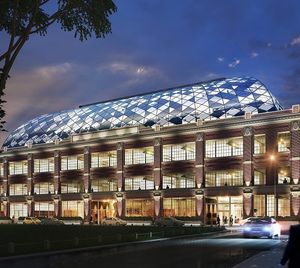 Fixmart were awarded the contract for the supply of all M&E Support Systems and Containment for the Electrical, Mechanical and HVAC contractors for this elegant and imaginative re-development.